A search view is used to search and display multiple records from your database. Searches display multiple records from an object in your database using rows and columns. 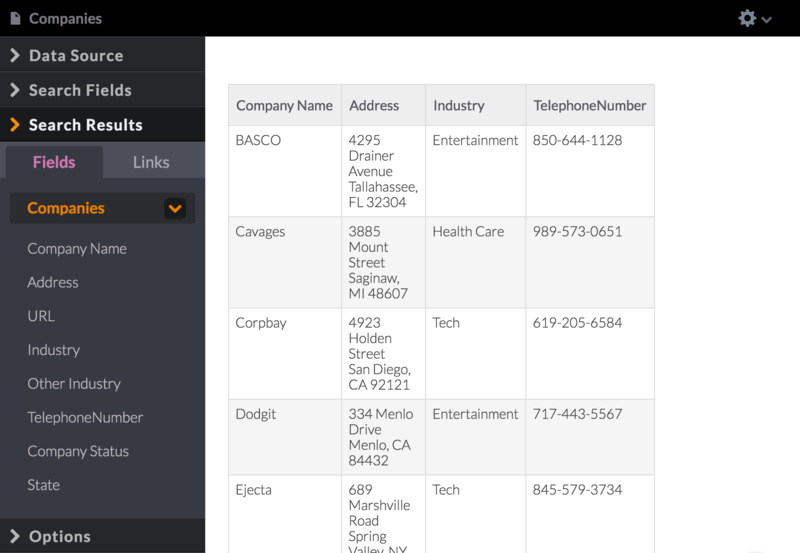 Any of the fields from that object can be used as columns in the search. Use the “reset” link to easily clear your current search and start again. 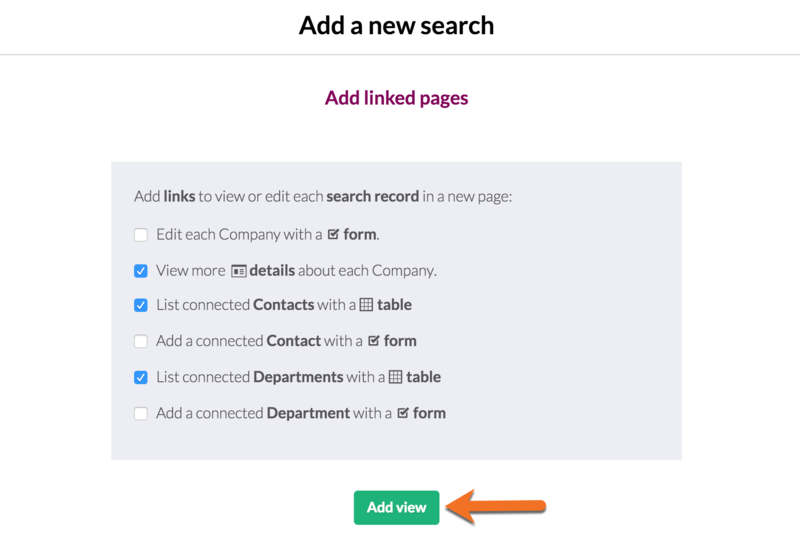 Each record in a search result can be linked to a child page to edit or view more details about that record. Note: Searches are 'AND' searches, which means that if you are searching by multiple fields, all results must meet all your criteria. New searches will include search fields for the first six fields of the object by default. The search will open in "edit" mode where you can use the menu on the left to edit different aspects of the search. Limit: show all of the available records or limit to a specific number. A title and description are listed above the search fields, and you can click on each to add or edit. These are optional and will display at the top of the search if added. Keyword search is a special option. While each search field will just search that field in each record, the keyword search will search every field in the entire record. Keyword searches must contain at least two characters and neither can be a special character. "is" and "is not": will return ANY record with an exact match, tokenized (segmented) by word. "is apples" will return "apples" and "oranges and apples" but will not return "orangeapples" or "apples123". Using the same available records, "IS oranges and apples" will only return "oranges and apples". "contains" and "does not contain": will return any record with a partial match within the entire string being searched. "contains apples" will return "apples" and "oranges and apples" and "orangeapples" and "apples123". Email addresses: Searching on email addresses is currently an outlier and does not obey "is" filters. Label: the text identifying the field that will display before the search input. 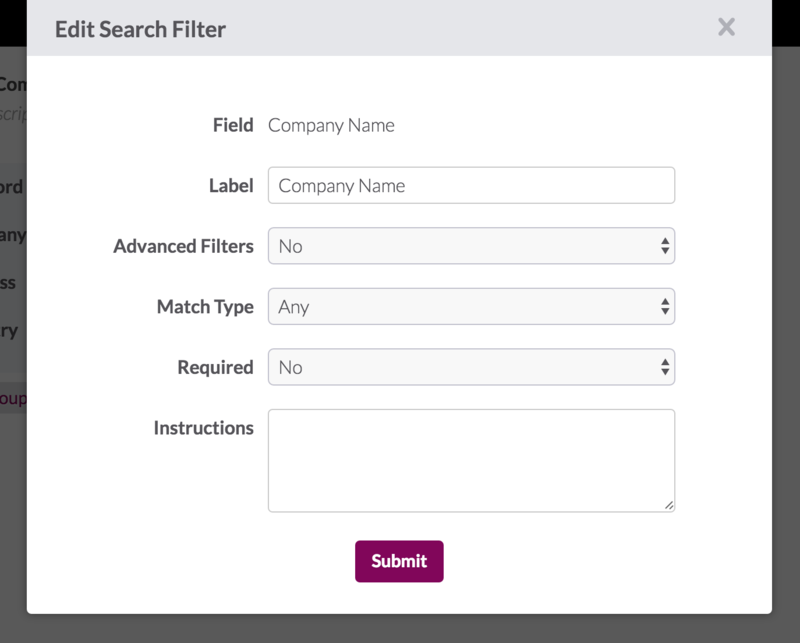 Advanced Filters: when set to No, the field will have a simple input to search by. When set to Yes, advanced filters can be added to further specify the search for that field. Each field type has specific filter options like "is", "is not", "is higher than", etc. Match Type: when the Advanced Filters are set to No, you can define what the match type is. Any will act more like a "fuzzy" search where any part of the field can contain the search value. Exact will require an exact match. 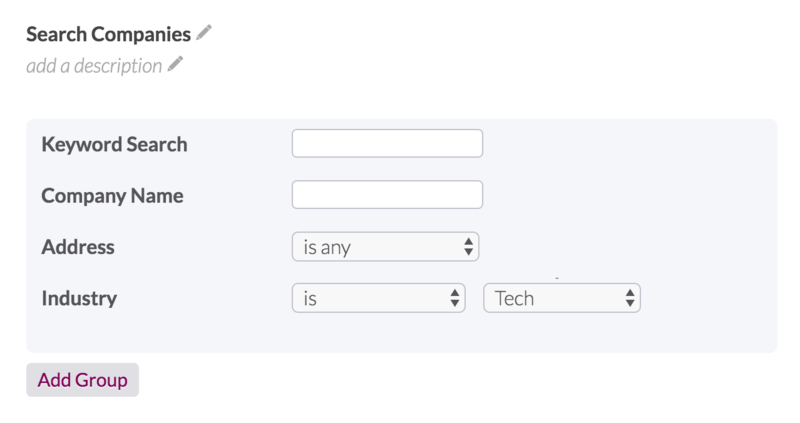 Required: a value will need to be entered for this search field in order to submit the search. Instructions: add instructional text if you want to offer more context or instructions for searching on that field. The text will display in a smaller font below the search field. 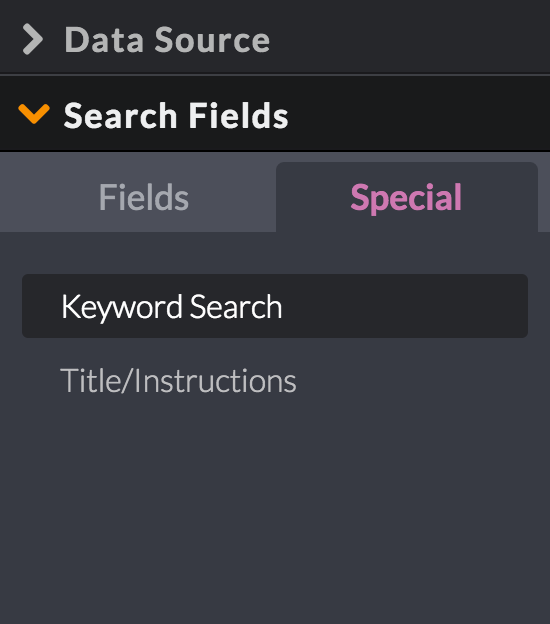 Change the order of the search fields by dragging any search field and dropping it into a new location. Delete a search field by hovering over it and clicking the "trash can" icon. Editing these options are identical to the table and list views, depending on your settings. For editing results in a table, view the table columns settings here. For editing results in a list, view the list details settings here. Show the results of the search in a table or list. 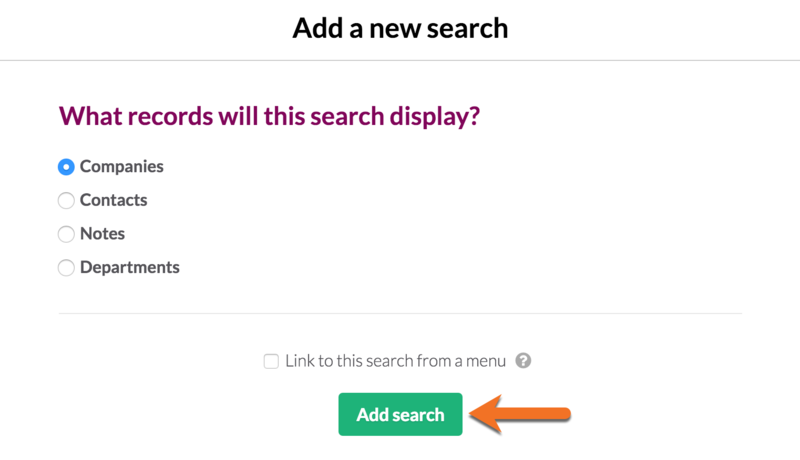 Changing this will automatically update your "Search Results" option from the left menu. Changing to a list will provide an additional option to display the results in 1, 2, or 3 columns. By default a search will start with no returned results; only the search fields will be visible. Check this if you want to also display an initial page of records. Pagination determines how many records will show at one time. If the total number of records exceeds the number set here, then links will be added to the search results table to navigate to additional pages, displaying more records. Show pagination controls at the bottom of the table: this will display pagination controls at the bottom of the list as well as at the top. By default, this will be the "page X of X" display. If the feature to allow users to set how many records to view per page is enabled (see the previous bullet point) this option will also show at the bottom of the table. 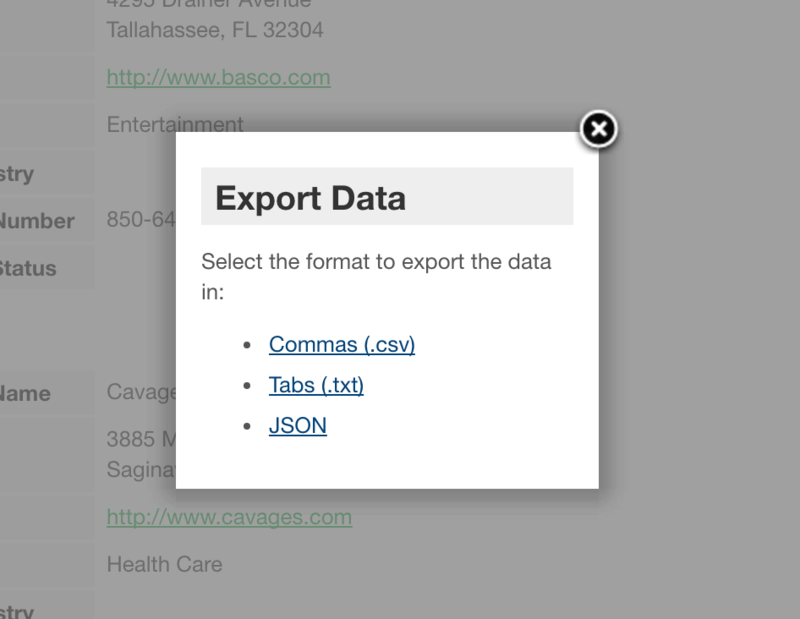 Note: the exported data will always reflect the exact data the table is displaying, including any sorting and filters. 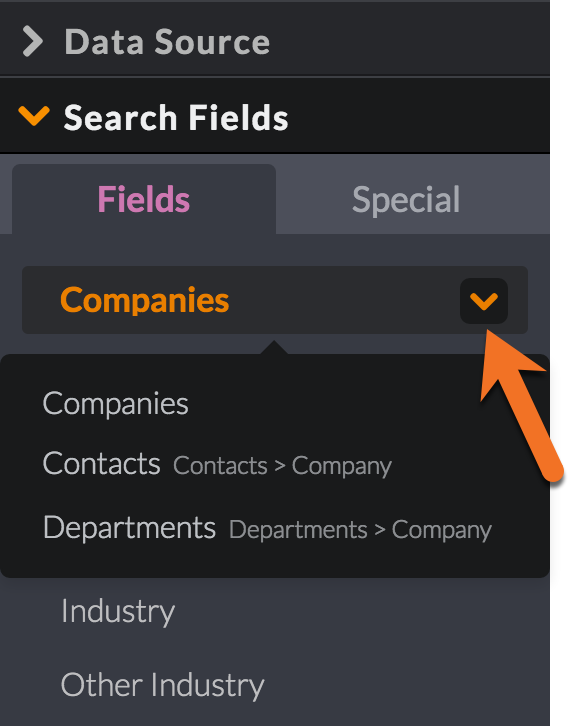 Search limits on connection fields: in order to optimize performance, searches are currently limited to searching 10,000 records. Searching on a connected object with more records than this will display inconsistent results. Data source filters can be used to narrow the search criteria to less than the 10,000 record limit.